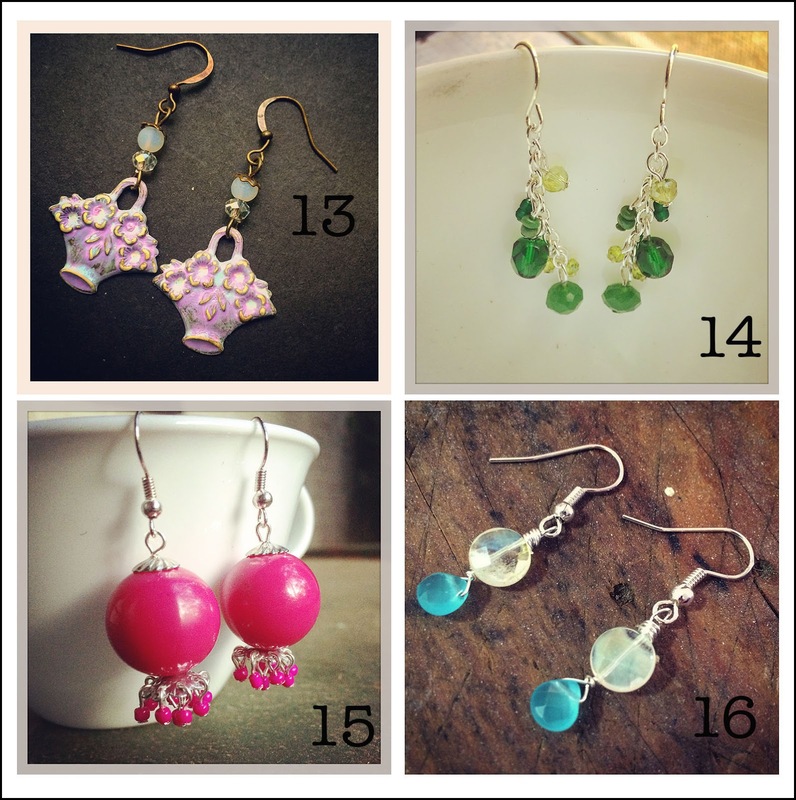 The 100 Day Project: Make 100 Earrings 1-20 and a GIVEAWAY! I did say giveaway - details are at the bottom of the post. I've been an earring-making fool! I don't want to jinx myself, but I've gotten my earrings made for the first 20 days of The 100 Day Project. The project takes place on Instagram and its purpose is to encourage creativity for 100 days. Each participant picks a creative endeavor: small, large, progressive, whatever and does it each day for 100 days, using #The100DayProject as well as their own unique hashtag. I announced my #Make100Earrings intent several weeks ago in a post about all the challenges ahead of me. As well, to make it easier on myself, I prepared a box of earring-making supplies that I can take with me wherever I go. Today is day 21. Before I work on the earrings for today, I thought I'd share here those first 20 pairs. 1: Those large beads needed to come out of the box since they took up so much room. Tiny yellow Chinese crystals from Znetshows.com and copper spacers and beads were tied onto off-white waxed linen cord to make a little fringe and accent the large beads. 2: Really simple and more my "romantic-rustic" style, these earrings were made with crystal teardrop briolettes and salvaged gold-tone beads. 4: These are my favorites in this set. The dangles are Vintaj blanks that I had altered. They're paired with bright teal beads and rhinestone spacers. Love! 5: I hadn't used any of my art beads yet. Since I was home this day, I dug through my artist-made stash and found these polymer clay beauties from Heather Powers of Humblebeads. To accent them, antiqued brass spacers, a bead cap, and a little glass flower were added. These are another favorite. 6: Wanting to do something simple, I used some silvertone connector links and a smokey-gray bead to make these. Easy-peasy. Done! 7: It was a beautiful day and felt so very summery. This inspired me to make these bright, bold earrings. 8: Again, I dipped into my stash of altered Vintaj blanks to make these earrings. They dangle from a stack of small, coordinating beads. 9: I hadn't included any buttons so far, and those amazonite rectangles were calling to me. I paired those elements with a short length of antiqued brass chain and called it a day. 10: Working from my travel box this day, the copper rings caught my eye. Simple dangles of white & clear beads completed the earrings. 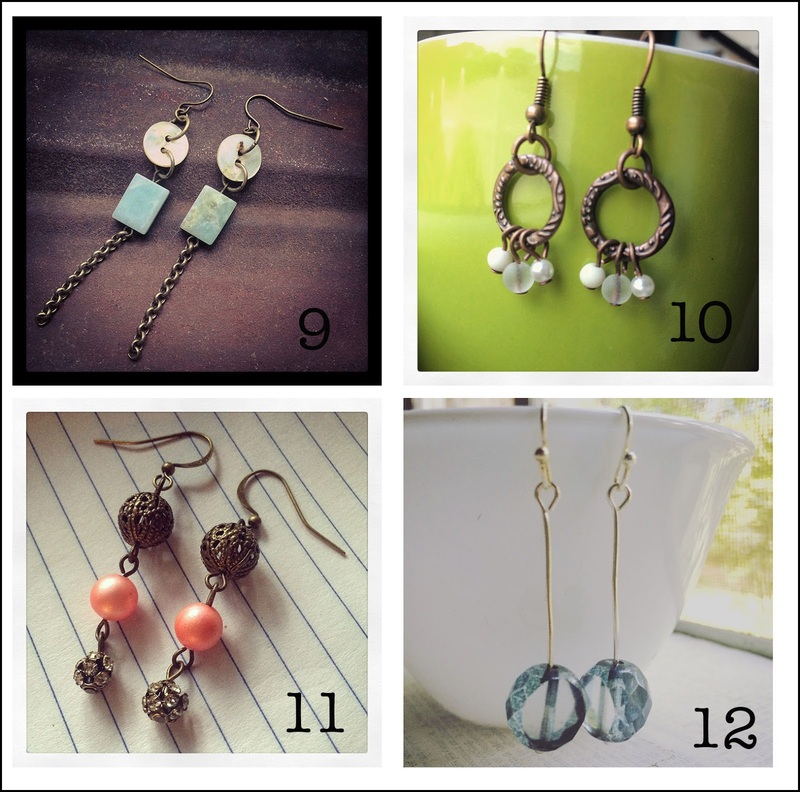 11: These were complete spur-of-the-moment earrings. All of the components came from the earring box, but I picked them out hurriedly to make the pair. I think it works. 12: I knew this was going to be another hectic day, so I grabbed these beautiful glass beads and simply let them dangle from balled head pins. 13: It was Easter. I wanted a basket. Finding these brass stamped baskets, I colored them with layers of Vintaj Patinas before dangling them from a few ZnetShows.com glass beads. 14: Feeling inspired by all the growing things outside, I was compelled to make some green earrings. I dove into the green drawer of my bead cabinet. Silver chain and head pins completed them. 15: Like the first pair of earrings I made, I just wanted to get these big pink beads out of the container. As well, I'd seen other designers use filigree bead caps as a base for chandelier earrings, so I let that inspire me. With matching seed beads, I worked these up as quick as possible. When my husband saw them, he thought they looked like octopi and suggested I add eyes. I did try, but the medium I used wiped right off even after hours and hours of dry time. I may try it again later, but wanted these done before the end of the day. So, I left them as they were. 16: This was a busy day of family visiting. As such, I picked out these beads and simply wired them together. Simple and pretty. 17: I didn't have much time before we headed to the beach to make anything. Pat suggested I collect shells to make my daily earrings. As you can see, that's exactly what I did. I know from previous experience that I can find shells with a single hole in them. 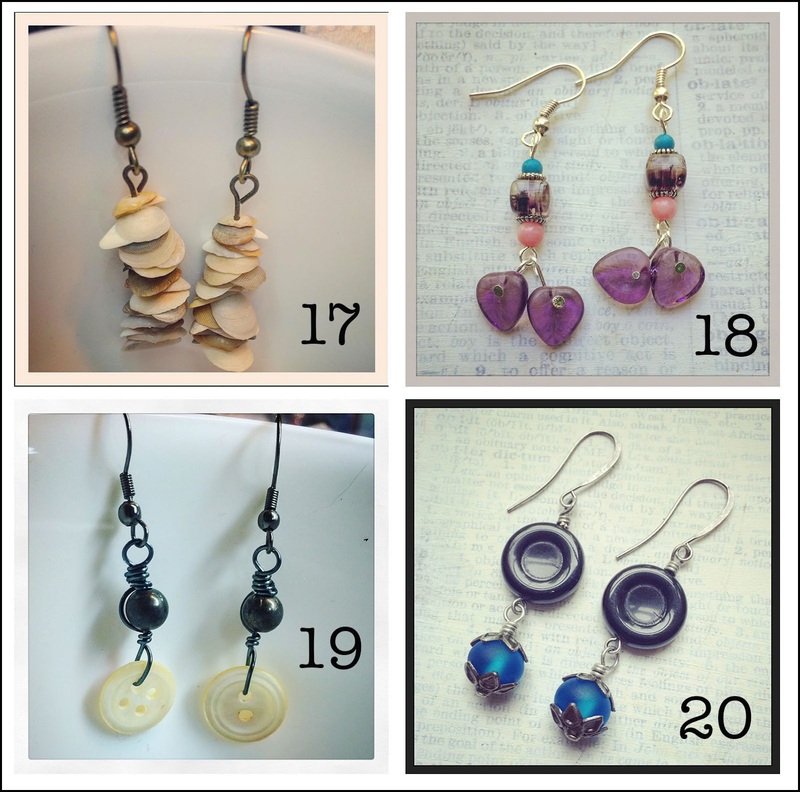 Here example #1 and example #2 of other jewelry I've made from found shells. I made sure to only collect tiny ones. At home, I evenly sorted then stacked them onto head pins (using a seed bead to start). However, while bending the wire to make the loop, several of the shells broke - hence the space at the top of the earring on the right. I got them made at least! They can't all be winners. 18: I picked through some of the pairs of beads I had from what Kari sent me for the Bead Peeps Swap N Hop and selected the purple leaves and cube. The spacer and other beads came from my own stash, but worked out nicely. 19: After a full day poolside, I realized I hadn't made any earrings yet. I picked up the mother of pearl buttons, tarnished silver beads, and hematite-colored wire that were on my desk for another project and whipped these up. 20: Yesterday was my oldest niece's birthday. With her in mind, I selected the blue lampwork beads that had been freebies from Mermaid Glass when I ordered something else (at least that how I had them marked!) She likes blue almost as much as I do, but also loves black. I've had these vintage black beads in my stash since the dawn of time (or sometime there abouts). Antiqued silver tone bead caps and findings finish the earrings. For the most part, I'm happy with the the earrings I've created. I know they're not all winners or something I'm going to try to sell (the shell earrings!!). However, I'm really pleased that I've been able to get a pair made every day despite a busy schedule and vacation. The 100 Day Project is working for me! Oh, I did say something about a giveaway didn't I? Which two pairs are your favorite? Let me know in the comments and leave your e-mail address by May 13th. I'll pick and announce a winner on May 14th (Mother's Day). You just might win your favorites. Oh, and this is open to only US residents. Sorry!! Great job! Your dedication is inspiring! #5 and #10 are calling my name! They are all awesome! Thanks for the giveaway! Thank you! I'm hoping this little project will remind me that I can create something every day no matter how tight my days are. It's working so far. But, we're only 1/5 the way in. Eek!! Thanks for stopping in and playing along. Good Luck!! I applaud your commitment!I love your originality and style. #8 & #4 are my absolute favorites so far. Looking forward to see more earrings to come. They are all pretty cute, but I'd have to say 4 and 5 are my favorites! Thank you! Those two seem to be the general favorites right now. I'm so glad you like them as well. Good luck! Before you mentioned the Giveaway, I was eyeing numbers 1,2,11,12,14 & 20 as being my favorites, only slightly above several others that I really like as well! As I look back, trying to narrow it to 2,I keep wanting to add to that list rather than take away. 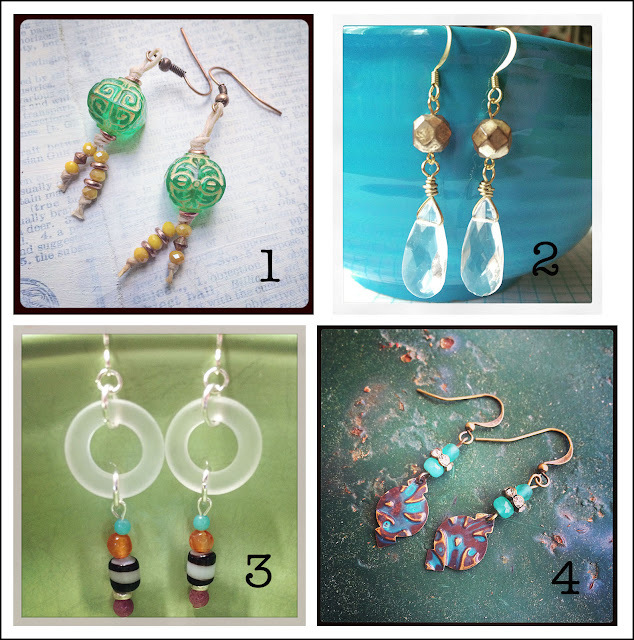 Ok, I'm going to say 2 and 20 look like earrings that I would wear the most! Keep it up! I can't wait to see more of the results! Ha. Yeah, the shells aren't one I expect most anyone to like. They were my version of faking it. I'm so glad you like so many of them!! That means so much to me. Good Luck! 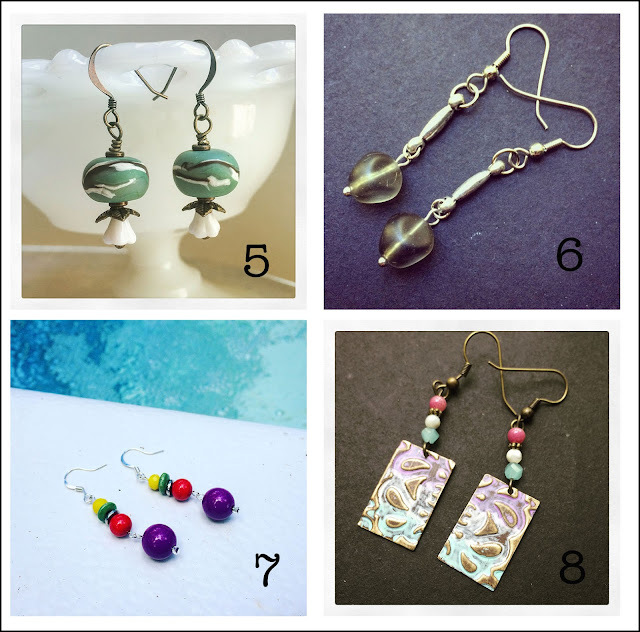 Number 5 is my favorite out of so many pretty earrings (and PINK, oh I love pink!) There's just something sweet about them AND I just painted my toes that light teal color! lori at lorianderson dot net is my email -- well done!!! I like 5 and 12. They are all beautiful! You are very talented! Thanks for the chance to win a pair. Oh. Those are two beauties for sure!! Thank YOU for stopping in and taking a peek. Good Luck! These are all beautiful and I couldn't pick just one favourite. I love 4, 11, 16, and 20. Also, I'm Canadian but head to the US regularly and would gladly drive to the border post office to pick these up! You are on fire! Only 80 more to go! lol. #9 and #13 are my favorites. I really like the buttons with the chain dangling down. Mod chic! And I liked how you layered the patina colors on the basket. So pretty! I like many of the others too. I am enjoying your 100project, Hope! I admire your dedication to the process. I don't enter too many giveaways, but had to throw my hat in the ring for this one. Thanks Hope! Aw thanks! I've got you entered. Good Luck!! My daughter and I both chose 11 as our favorite; we love the vintage look and the coral bead. She said it looked like it would have been worn on Downton Abbey! My second choice was so difficult, but I finally decided on 10. They still have a vintage feel, they would go with any outfit, and I love copper! You are so talented even with the ones you said you put together quickly. I've enjoyed all your creations. My two picks are #9 and #11. Email: lhamilton114 at gmail dot com. Thank you!